Portraying Apple's new corporate campus as an "investor relations nightmare," a new report reveals that the project's budget has increased by $2 billion, causing it to become a year behind schedule as the architect looks to cut costs. Citing five people close to the project, Bloomberg reported on Thursday that the cost of Apple's so-called "spaceship" circular campus could now exceed the $3.9 billion cost of New York City's new World Trade Center complex. The increase in costs has reportedly led to a delay in the project, as architect Foster + Partners seeks to cut $1 billion from the budget. Apple Chief Executive Tim Cook already revealed in February that his company plans to move to its new "Campus 2" by 2016. That's a year later than the company had originally projected. Late Apple co-founder Steve Jobs had a hands-on role in designing the facility. He personally revealed the project at a Cupertino City Council meeting in June 2011, just months before his death, where he noted that the project would be costly due in part to its use of curved glass. "There's not a straight piece of glass in this building," Jobs said. "We've used our experience in building retail buildings all over the world. We know how to make the biggest pieces of glass for architectural use." With the project now apparently over budget, Bloomberg questioned how investors would react to the cost of the project. At the end of its last quarter, Apple had $137 billion in cash reserves. "Investors didn't squawk much when Apple was dominating the smartphone and tablet market, but shares have fallen 38 percent since September amid rising competition from Samsung Electronics and concerns about Apple's product pipeline," author Peter Burrows wrote, adding that critics would ask whether "curved glass is the best use of funds." Most of the cost of the project lies in materials and "fit and finish." Under the plans overseen by Jobs, there will be "no seam, gap, or paintbrush stroke showing; every wall, floor and ceiling is to be polished to a supernatural smoothness," the report said. Even the interior wood must "heartwood" from the center of trees from a a specific series of maple. The report speculated that some of the $1 billion in cuts that have been made to the project will come from some of those "fit and finish" aspects pushed for by Jobs. For example, the former CEO originally wanted polished concrete ceilings that will be cast in molds on the floor and lifted into place. The circular four-story main facility will be one of the largest buildings in the world at 2.8 million square feet. 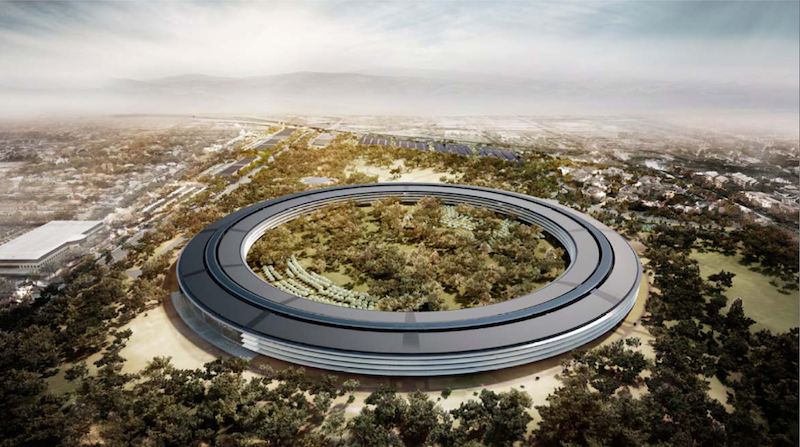 The project earned its "spaceship" moniker from Jobs himself, who said at the Cupertino City Council meeting that the project would look like one had landed in the city.